Our landscaping team in Lambeth are also experts at redesigning hotel or manor grounds and can turn any garden space into something that is memorable for all to see. Experts at working with all sorts of garden design, our gardening professionals in SE11 can mow your lawns, sculpt your trees and plant your flowers with ease. 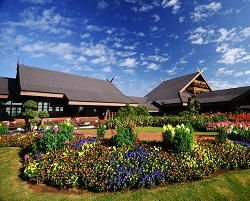 So if you want to make your garden something to really remember, book a visit from our gardening experts today. With an extensive team of gardeners, our company in Lambeth can guarantee to visit your commercial grounds as often as you need. In addition to this, our gardening firm in SE11 is confident that employing us will never be more expensive than hiring an in-house team and are happy to work as flexibly as you need. All of our gardening services can be paid for on account and will always be carried out by a team of our dedicated gardening professionals. Hospital stays can be a terrible ordeal at the best of times but when you’re left worrying about your garden your stay can be made even worse. 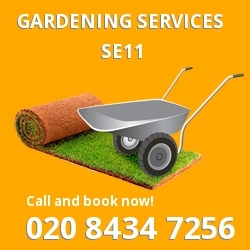 Our gardening team that serves around SE11 know that coming home to a neat and tidy garden can really help to lift your spirits and that is why we offer an excellent garden maintenance and garden clean up package which can help to keep your garden green while you get back on your feet. At London Gardeners we know that plans can change quickly when you’re unwell so all of our Lambeth gardening services and gardening professionals can be booked on a flexible basis with no hidden cancellation fees. If you’ve just moved into a new home in the Lambeth area then you may need some help getting your new garden up to scratch. Our garden design team in SE11 are experts at helping you to create your dream garden and can work their magic on any garden shape, size or style. So if you want to create a cosy and vibrant flower garden, or a chic and sleek patio terrace, our Lambeth landscaping team are sure to be able to help. All of our garden landscaping team are dedicated to transforming your garden and will never leave any planting, lawn mowing or patio cleaning undone. Our autumn gardening services are just as important as any of our other seasonal packages for the Lambeth area and can all play a part in how your front yard looks during those sultry summer months. Falling leaves can suffocate your lawn while hedges need to be cut back before the winter. 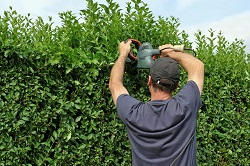 That is why our gardening experts in SE11 offer a great leaf collection, hedge trimming and pruning service so that you can spend the last of your warm days in true garden bliss. Autumn is also the time to invest in some serious lawn care for your Lambeth garden so that you have a vibrant and flourishing lawn in time for next year’s summer fun.